Provide comfort for the family of Helen Vile with a meaningful gesture of sympathy. 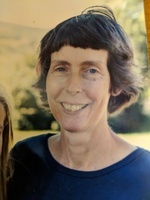 Helen Vile, 76 of Chapin Road, Essex, VT died peacefully on February 20,, 2019 at the Residence at Quarry Hill, So. Burlington of complications due to Alzheimer’s disease, with her husband (Charles Vile) at her side. Helen was born January 9, 1943, to Martin and Helen Buehler of Broomall, Pa. She received a bachelor’s degree in Elementary & Library Education from Millersville State College, Millersville, Pa in 1964 and a Master’s degree in Elementary & Library Education from Penn State in 1967. Helen taught at Marple Elementary School where she had once been a student herself. She worked at the Frederick Public Library, Frederick, MD when her husband was posted nearby in the Army. Helen and Chuck moved to VT in 1969 where she worked at the Johnson State College Library. When the first of her three children was born, Helen chose to stay at home to be a full time mother to her family. Once her children were in school, Helen worked at the Ethan Allen Homestead and then for 15 years at Community College of VT where she was well liked and much appreciated by the staff. She also volunteered at the Brownell Library. Helen was an avid lover & reader of Children’s Literature. She would tape record books for the enjoyment of her children and liked reading to her grandchildren. Helen also enjoyed walking on Chapin road, hiking, gardening, particularly flower growing and would freeze & can the garden vegetables. She was a avid fan of her children’s and grandchildren’s athletic activities. Helen is survived by her husband of 52 years Charles, (Chuck), Vile and their son Timothy Vile and his wife Stacy McKiernan of Northfield, VT; their daughter Amy Vile and her husband Dr. Spencer Sherman and their son Isaac of Colchester, VT; their son Peter Vile and his Wife Dr. Emilie Beaupre and their sons Liam Vile and Jack Vile of Essex, VT; and (her) sister Barbara Ann Buehler and her husband Jerry Quammen of Downingtown, Pa.
A memorial service will be held at the Good Shepherd Lutheran Church, Rte 15 Jericho, VT on Saturday, April 27, at 1:00pm with a reception to follow. A memorial service will be held at the Good Shepherd Lutheran Church, Rte 15 Jericho, VT on Saturday, April 27, at 1:00 pm with a reception to follow.